Home » Tea & Coffee Makers » Tea Brewers & Kettles » What is the Best Tea Kettle for a Gas Stove? What is the Best Tea Kettle for a Gas Stove? If you’re even a half way appliance junkie like me, chances are you have more electrical kitchen appliances than you do power outlets, so you have to unplug something in order to use something else. While an electric tea kettle may sound convenient, a stovetop one is not any less if you’re willing to wait just a few minutes more, so you should consider getting one to use on your stove, especially if you suddenly lose power for whatever reason. For those of you with gas stoves, you’ll need to select a kettle that is suited for the flame. The great news is that modern day tea kettles for gas stoves come in some very nice designs and don’t look like monstrous utilitarian kettles of old. So if you’re looking for the best tea kettle for gas stove, we have a few suggestions that we’re sure you’ll love. The best stovetop tea kettle should boil quickly enough even if it is a large one that’s full, be easy to pick up by the handle without the need for a pot holder even when the water is boiling, and should not leak when being poured. Almost all have the ability to whistle once the water starts boiling, but you have to make sure that you don’t fill the kettle beyond the maximum level line. Stovetop kettles can be made of a few different materials so we’ll pick the best from each type. However, if you’d like to have a broader selection, Amazon is the place to go for the best deals. You should know that if you’re particular about the temperature of water needed for different types of teas, particularly white or green, you will need temperature control that you can only get with these electric tea kettles. If you want water heating and tea brewing all in one gadget, choose an electric tea maker that includes a steeping basket. Made with pure borosilicate glass, nothing looks quite as elegant as a glass tea kettle, and this whistling tea kettle from Medelco is possibly the best glass tea kettle stovetop choice. Although it is glass, you can put it on either a gas flame, glass top stove or an electric burner as long as the metal heat diffuser trivet is used with it. It is very reasonably priced, and the 12 cup capacity should satisfy any need for tea or hot water for cereal, instant hot drinks or pour over coffee. Although the handle and lid are made of heat resistant BPH-free phenolic resin plastic, users say that once the water starts boiling they do get hot. However, they should last for a lifetime of use, and the lid is removable for easy cleaning but watch out when you’re pouring, as it can fall off. The kettle is stain resistant and you can also put it in the dishwasher. You’ll either love or hate the design, but make no mistake, the Chef’s Secret Stainless Steel Tea Kettle is one fine way to boil water and is the best copper tea kettle that you can buy if you’re always in a rush for a cup of tea. The bottom is about 9″ across with a central copper capsule that’s recessed so it can also be used on an induction cooktop. Even though it resembles a regular tea kettle in many aspects, the bulbous bottom exterior ring gives a pudgy look to it. That’s not necessarily a bad thing because that extra heat catching area brings the water to a faster boil than most. The insulated handle is perfectly placed for even weight distribution when you pick it up, and the teapot spout lid opens with an ingenious and easy to grasp, spring loaded trigger. Better still, it comes with a limited lifetime warranty, and even though it may be one of the most expensive tea kettles on this list, if you love the functional design and can’t wait forever for water to boil, it will be worth every penny. A few users say that the inside rim of the lid has a tendency to rust, but most don’t have this problem. If you know anything about Revere, you’ll know that they are one of the leaders in copper bottom technology on pots and pans. Well, this Revere copper bottom tea kettle uses that same technology which heats water fast in a lovely stainless steel design with a copper bottom plate. The handle and the tea pot spout lid are made of phenolic heat resistant BPH free plastic, with the rest being made of surgical stainless steel with mirror finish. Just use the button on top to open up the spout, stop the whistle, and pour your heated water into any cup, bowl or mug. The whistle on this kettle is not very loud and in recent months, some users have complained that the spout lid melts after a few uses. The melting spout cap issue seems to be a recent one, so we’re keeping an eye on these complaints to see if its a defect that will be corrected by Revere. Until then, you may want to consider the Chef’s Secret kettle above if you specifically want a copper bottom one. If a porcelain coated tea kettle is your cup of tea, excuse the pun, then the KitchenAid 2 Quart Tea Kettle must be considered. It comes in a variety of colors, from red to green, sky blue to yellow, and many different and unique colors in between. With those types of colorful tea kettles available, you should certainly be able to find one that fits your kitchen decor. There is a steel trim band that goes right round the circumference of the kettle too. The ergonomically positioned “C” handle makes holding and pouring easy. The finger flip spout lever, is right at your thumb tip. Enamel coated tea kettles may take a bit longer to heat the water, but the enamel coating acts like insulation, so the water will stay hotter longer. This is especially good if you take it off the stove and place it on a hot pad, where you, or others, will have easy access for every cup or bowl full of water that you desire. The inside of the kettle is stainless steel and so is the spout lever, but while you would think that this makes it too hot to touch, it actually only gets warm and is quite easy to use when it comes time to pour. The lid is removable to make the kettle easier to wash. This is an incredibly durable and functional tea kettle, and as proof, KitchenAid offers a limited lifetime warranty. The only real negative that users point to is that its whistle is low, so may not be heard if you are in a faraway room. With a modern design all of its own, the Circulon Contempo Tea Kettle has an enamel exterior and interior with a steel layer encased in between. The “T” handle allows you to grip it where it feels most comfortable and gives you the best balance and stability, whether the tea pot is full, half-full, or there is one more cup left to pour. Realistically, for someone with a weak or compromised wrist action, this would be ideal. Of course, since it is enamel coated, it will take a smidge more time to heat up, but it will keep the water heated longer when it is off the stove. It comes in several different colors and the spout cover is made of BPH free heat resistant phenolic resin plastic. This spout cover can be left open if you don’t want the kettle to whistle, which is rather loud. However, if you leave the kettle on and go to any other room in the house, you’ll be sure to hear it. The smallest kettle on this list goes to the Hario V60 Buono Coffee Drip Kettle. And although it is listed at 1.2 liters capacity, true capacity is .8 liters because if you fill it to the 1.2 liter mark, water will bubble out when it reaches the boiling point. That said, this is the most elegantly designed kettle on this list. The spout, which does not whistle, is thin and curvaceous, which lends itself to a more controlled pour over your tea leaves. In fact, if you’re also a manual pour over coffee fan, this is one of the best kettles you can use to slowly and accurately pour hot water into a coffee dripper. You can easily wet your coffee grounds or tea leaves slightly by dribbling water over the top, let them bloom fully, then pour the water onto the grounds for a full brew. 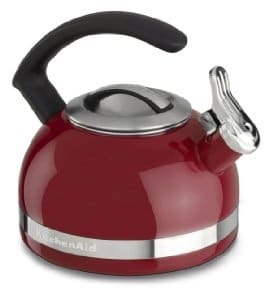 Due to its size, this is the fastest heating kettle here and would work great for a personal tea kettle, or a couple. It would even be superior in a dorm room or an RV, so long as there is a heat source that it can be set on top of, which can be a gas stove, electric or induction. Although a bit expensive on the surface, if you are looking for precise control when pouring hot water, or you just love the way it looks, then this is the kettle for you. Leave it to the people at Mr. Coffee to offer a unique design at a reasonable price. But that’s what you get with the Mr. Coffee Flintshire Whistling Tea Kettle. This kettle is available in 4 sizes ranging from 1.5 quarts to 2 quarts. The design is exactly like the Chef’s Secret Kettle listed above. You’ll get the same style of exterior bulging ring, which increases the heated area making for a quicker boiling time, the same water volume, the same stainless steel construction except with a brush satin finish, and you’ll get it at half the price. What’s not to like? The only major differences are that the Mr. Coffee does not have a copper insert, and the trigger that opens the spout cover is not as unique or stylish. Plus, it only comes with a limited 1 year warranty, unlike the lifetime warranty of the Chef’s Secret. But if you can get past the differences, and they are the only things holding you up from getting a decent quality tea kettle, save your money and go with the Mr. Coffee Flintshire.